Barra or Eilean Bharraigh (in Scottish Gaelic) is a predominantly Gaelic-speaking island, and apart from the adjacent island of Vatersay is the southernmost inhabited island of the Outer Hebrides (Na h-Eileanan Siar) in Scotland. 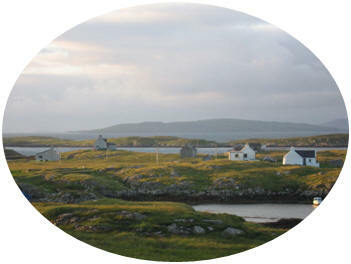 The area of Barra is 35 square miles, the main village being Castlebay (Bàgh a' Chaisteil). Barra is now linked by a man-made causeway to the neighbouring island of Vatersay. The Clan MacNeil has strong ties to the Isle of Barra and can trace its lineage back to the O'Neills of Ulster who came to Barra from Ireland around the year 1000. Kisimul Castle at Castlebay is the hereditary seat of the MacNeils. It is located on an island in the bay, so giving the village its name. Other places of interest on the island include a ruined church and museum at Cille Bharra, a number of Iron Age brochs such as those at Dùn Chuidhir and An Dùn Bàn and a whole range of other Iron Age and later structures which have recently been excavated and recorded.